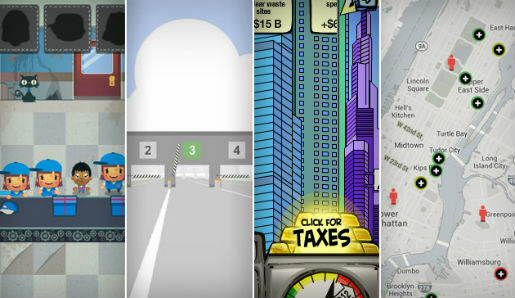 Newsgames, like those pictured from the New Yorker, the New York Times, American Public Media and ProPublica, have the potential to teach readers complicated topics. Journalists can learn a lot from videogames. Games can help players explore unfamiliar worlds and experience stories, almost literally, through the eyes of another person. Designed well, videogames guide players to feel emotion and conflict, as well as learn the intricacies of complex subjects and systems. They engage users in a highly meaningful, memorable and influential way. But videogames don’t require an expensive console system or high-end computer. They can be powered up on our smartphones and on Facebook, and many people who would never call themselves gamers are playing games and getting familiar with how the medium works. And it’s not all just escapist fun — there’s a community dedicated to exploring how games can be used in education. "For journalists, games can be a great tool for us to use to reach, inform and engage our readers." For journalists, games can be a great tool for us to use to reach, inform and engage our readers. There’s a Chinese proverb, “Tell me and I’ll forget; show me and I may remember; involve me and I’ll understand.” When I talk about multimedia I do think about “Show me and I may remember.” You hear a compelling voice or see a compelling image and you’ll remember, but you may not totally remember until to you are involved with the story. So in our mission to help our readers understand complex subjects, how can we get games to do the heavy lifting? Games mock realities that, at their best, can make players feel an emotion more powerfully than any other medium. You are the on-screen actor, and you control the game’s plot through your actions. Having control means you’re responsible, within obvious bounds, for what happens in the game, so achievements, failures, consequences and the emotions those come with, belong to you. 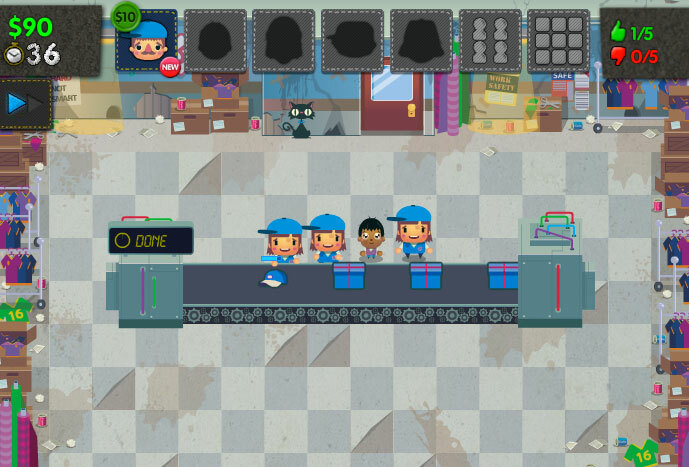 Understand what it means to be a part of the sweatshop system by playing Sweatshop. Whereas a film documentary might piece together the sweatshop story through footage and anecdote, the game allows players to experience the system from the inside with all its cat’s cradle of pressures and temptations. Simulations games like Sweatshop create a mock reality that lets players come very close to experiencing something first-hand — close enough to confront the pressures and emotions of the real thing. When used to inform the public, such games provide a unique strength: generating understanding through emotional involvement. Two components of game design are the storyline and the mechanics. The storyline of Sweatshop involves the sometimes difficult choices facing the middle-manager of a sweatshop — do I always treat my workers ethically and risk my job (a.k.a. losing the game), or do I force them to work at double speed, make more money and keep my boss happy? Along with a strong storyline, a game needs well-designed rules governing what actions players can take. These rules are referred to as “game mechanics.” Well-designed game mechanics can elicit the same emotions evoked by a well-crafted narrative news story — for the right player, the emotional impact of a game can be even stronger. All of this is why we love games, and it’s a powerful argument for using them to tell news stories. Our job as journalists is to inform the public. By using emotion and empathy, games allow us to inform readers in a new way — and one in which they both remember and understand. 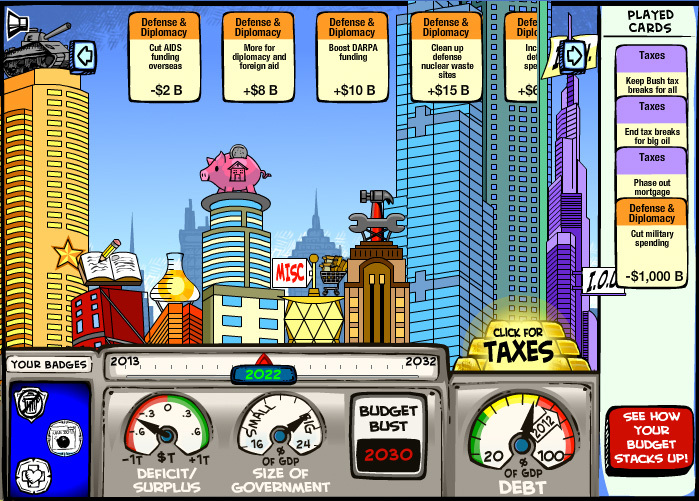 In 2008, American Public Media published a popular simulation newsgame called “Budget Hero,” which asks players to build a federal budget that can stay balanced over the next 30 years. The game is kept up-to-date regularly — for example, it takes into account the January 2013 fiscal cliff — and if you play the game without making any budget changes, the game displays a real projection of how current federal spending affects the budget over the coming years. One of the most engaging parts of the game is how Budget Hero helps players understand the complexities involved in each budget decision. Every argument for and against a policy, as well as its impact, comes from extensive reporting, data and modeling work. None of the decisions provide an obvious and easy “right” thing to do, and arguments for and against each decision are very compelling. Players are forced to make tough calls, and are kept well-informed of the consequences. One of my favorite newsgames is New York Times’s Gauging Your Distraction by Gabriel Dance, Tom Jackson and Aron Pilhofer, which asks players to drive and text simultaneously, and requires you to do both well. Throughout the game, players must maneuver between six lanes as directed, all while texting corrected-spelled messages back to a friend. See how well you can drive while texting. Gauging Your Distraction, by the New York Times. At the end of the game, players find out their reaction time and how it compares to the averages, and many feel compelled to play again to improve their score, thus giving the game great replayability. Perhaps unsurprisingly, texting while driving can take a horrible toll on your reaction time, and an even worse toll on your attentiveness to anything other than your phone. Play the game to see what I mean. Both of these simulation games are great examples of “show, don’t tell,” but also of how to “involve” players in the story itself. Making a newsgame isn’t that much different than making an interactive graphic, and the technology doesn’t have to be very different from what we already use. For example, at an Editor’s Lab hackday focused on “Newsgaming” in New York City a few months ago, Al Shaw, Amanda Zamora and I created a newsgame called HeartSaver. Players are shown a map of New York City, and are tasked with getting as many heart attack patients to emergency care facilities as possible. We simulated two additional obstacles into the game. First, different hospitals and facilities have different heart-attack survival rates. Second, the amount of time spent in transportation to the ER also affects a victim’s chance of survival. We used the best data we could find in two days, including querying the Google Transportation API for real transportation times between two locations, and data from the Emergency Medicine Journal on survival rates for heart attack patients. Using real world information in the game not only makes it more powerful and effective, it puts the “news” in newsgame. When we were testing the game, we took away one lesson very early on. Certain outer boroughs of NYC have no nearby emergency rooms. When heart-attack victims showed up in those areas of the map, we struggled to find the best hospital to send them to, because every facility was far away. So we made that one of the key things players learn while playing the game. Though HeartSaver only lasts 15 seconds, we were able to communicate a very memorable and powerful message. If the hackathon had lasted another 24 hours, we would have pursued our plans to add an interactive graphic readers would see after the game. Once you’ve experienced the problem for yourself, it’s only natural to wonder your own distance from the nearest emergency room, and how well that ER rates in heart-attack care. A good interactive could do that. If you are inspired to try this yourself (and I hope you are), keep these four game design rules in mind. There are exceptions to almost every one of them, but they’re a good guide to getting started. 1. Make your game fun. When you’re designing and testing the game mechanics, ask yourself if playing your game is actually fun, no strings (or learning) attached. No matter what it is you’re trying to teach players, or guide them to experience, if the mechanics aren’t fun, or if the content isn’t compelling, they won’t finish playing. Or, they’ll play once, tell no one, and never return. 2. Your game must have an objective. Without an objective for players to accomplish, a newsgame is really just an interactive graphic. Games with no goal, and even more so those with no message, can easily make players feel bored and aimless, which will only cause them to leave the page, or quit your game. 3. The result of the game should not be predetermined. A player’s actions should influence his or her fate in the game. If regardless of her choices, a player will always meet the objective, or reach the same ending, then the game won’t be challenging or meaningful. With real (or even semi-real) stakes in the game, players will be actively engaged. 4. Give people a reason to play again. Games should invite players to play again — whether they want to improve their score, encounter harder challenges, or discover something new. If “content is king” in journalism, replayability is king in gaming. It’s easy to confuse games with gamification; the words are a bit similar. Gamification adds game-like elements to activities that are not really games. Foursquare is an excellent example. The service encourages you to check-in to a location while you’re there in real life, which gains you points and mayorships and badges, and then asks you to compete with your friends. But there’s no real goal, no plot and no undetermined future that depends on your actions as a player. Frequent flier miles and credit card reward points as gamification too, but these systems aren’t games either. Full-fledged games allow players to take actions that determine whether they successfully accomplish pre-set goals. They use story and character to connect with players emotionally and they test a player’s creativity, strategy and dexterity in completing challenges. You don’t need to start from scratch to create a game. There are many ways game engines and gaming libraries can get you started. Here are two options I’d like to highlight. This free tool helps you create choose-your-own-adventure-stories, and requires no coding at all. If you need help using the software, Twine has screencasts to help you use it. At the end of the process, you simply click “Build Story” and Twine will generate a simple HTML file for you to upload to your website and publish. The game has two goals. First, to educate those not suffering from depression and help them understand “as clearly as possible what depression is like.” Second, to help those who suffer depression understand that they are not alone. This game is also a great example of when to break the “make your game fun” rule. Playing Depression Quest is the polar opposite of what we’d normally consider a fun activity. But the game captures your attention because of how well it presents a real and deep experience. At the same hackathon where we created HeartSaver, the Wall Street Journal team made up of Roger Kenny, Lakshmi Ketineni and Sarah Slobin created The Federator, an economic simulation game that was programmed with ImpactJS. There are many places to turn. While some of these resources are not focused on newsgames specifically, they’re helpful for understanding game design overall. Read Ian Bogost‘s Newsgames: Journalism at Play and Persuasive Games. Kotaku has a great beginner’s guide to making your first video game, which includes topics such as how to play-test your game. Gamasutra features good writing on the art of making games. Many of their articles are listed in The Big List of Game Design. John Osborn keeps a Newsgame Directory which includes games published by news organizations. NICAR Talk: Let’s Make Games for News! This post was originally published on ProPublica’s Nerd Blog and used here under Creative Commons and the author’s permission.